I feel like a rockstar when I can get dinner made at naptime (thank you, turkey enchilada casserole!). I’ve showered today. My hair is blown dry. The littles are peacefully napping (for now). 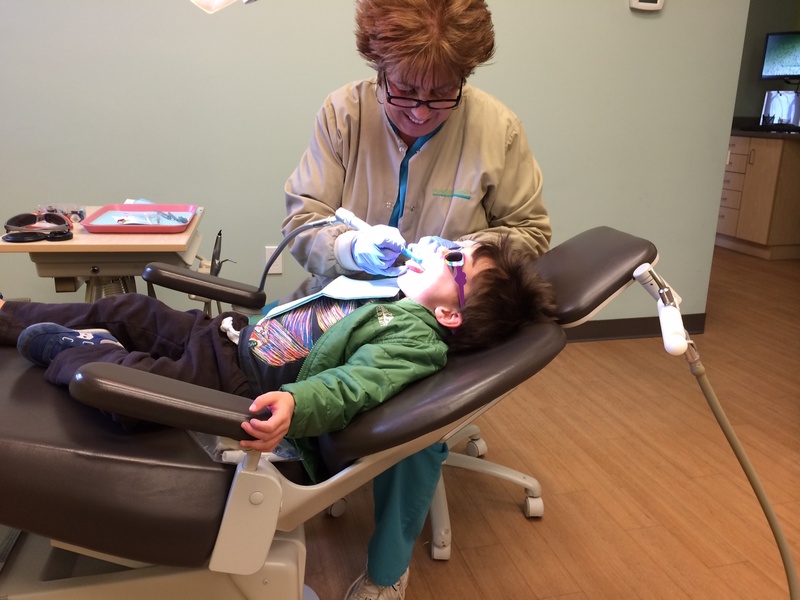 Owen and I even got to the dentist this morning (please ignore the fact that it’s been a year since we went last and consider this a win…)! This is all even more amazing since yesterday Emmett was diagnosed with a CRAZY contagious rash all over his body and Benjamin was working half the weekend. I have been trying to make us dentist appointments for about, oh, a year now. And by “trying” I mean I had a reminder set in my calendar that I kept looking at and thinking, “Oh! Time to call the dentist!”, but then getting sidetracked by anything and everything before actually doing so. We went last back in January 2013, which meant that our 6 month follow-up put us EXACTLY at Emmett’s due date. Well, anyone who has had a baby (and probably anyone who hasn’t) can tell you that dentist appointments aren’t usually high on the list of priorities once the wee babe pops out… so it took us another 6 months to actually get there again. Ummm, oops. The grandson of a pediatric dentist should do better, eh? At least our visit was a huge, cavity-less success. 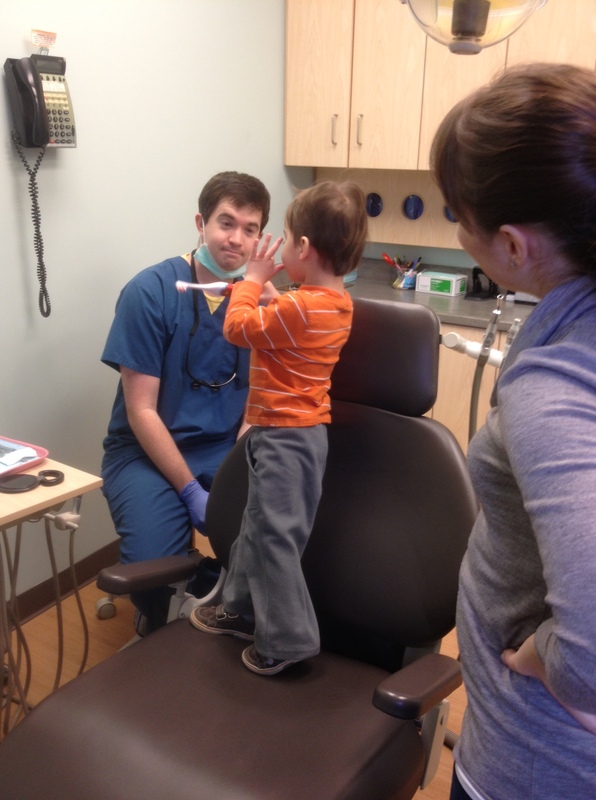 Benjamin’s dad is my dentist (why yes, I DO still see a pediatric dentist…) so Owen gets to see Pop when we go. Even more incentive to keep up with our appointments! 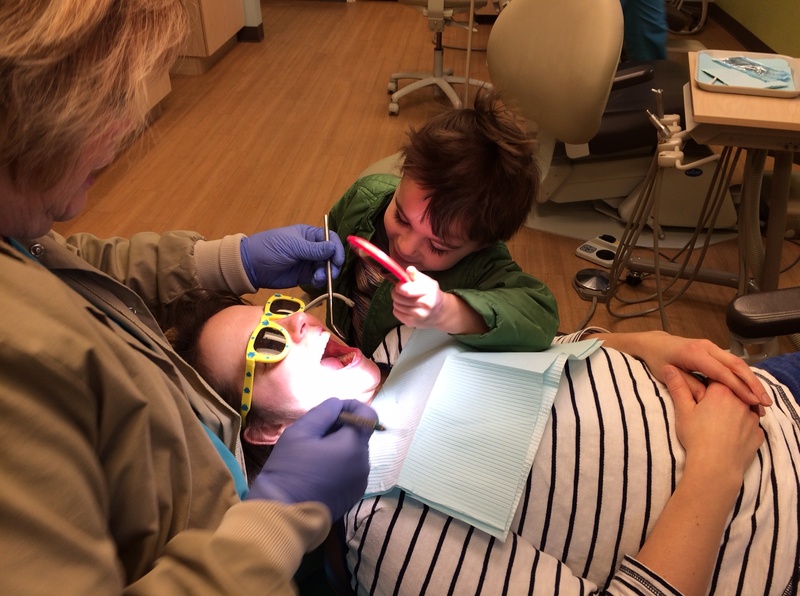 O hopped right up in the chair next to me, put on the cool shades he was offered, and chatted it up with all of the hygienists while they flossed and cleaned and counted his teeth. He could not have been happier or more at ease in the office. Hallelujah that he did not inherit my fear of all things teeth-related! He “played dentist” with everyone and loved getting to hit the buttons to move my chair. I’ve said it before and I’ll say it again, if any readers live in the Boston suburbs and need a pediatric dentist, check these guys out. I realize I’m biased, but I am always impressed with how they treat Owen when he is there. (Bonus: There are 2 adorable pictures of Owen blown up on the wall!). Everyone wanted to meet Emmett too, but alas, he was quarantined at home. On Saturday I noticed that Emmett was shaking his head around and acting kind of fussy. In the afternoon he woke up with a temp and all of my Mommy signals were screaming “Ear infection!”, so I made an appointment with our doc for Sunday morning. When I put him to bed on Saturday night I noticed two small red dots on the backs of his shoulders. He is constantly battling eczema and has very sensitive skin, so I made a mental note about it to ask the doctor about it on Sunday. I know some viruses can come along with a rash as well, so figured that’s what he was fighting. When he woke up in the morning, his arms and trunk were covered with what appeared to be boils or crusty sores. GROSS. The doctor confirmed my ear infection diagnosis, added on a symptom of blisters on the back of the throat and then called in 2 other docs to take a look at the weird rash. It looked like chicken pox, but the distribution wasn’t right. Long story short we figured out what it was (very contagious) and started treatment right away for all three things. SAD BABY. He hasn’t been eating or sleeping well, and won’t let us put him down. Can you blame him? Poor guy is exploding with an itchy rash all over his tiny little body! Benjamin was traveling all day Sunday (I survived the day without him!) but got home just in time before I had to handle double bedtime with a screaming baby. Phew. I’m just counting on my magical Mommy immune system to get me through this one without boils all over my body too, because I’m not going to not touch or hold my sad little guy. In the meantime I’m bleaching and doing a constant rotation of laundry in hot water and anything else I can do to stop this awful infections from spreading to other members of the family. Uhh, anyone want to come over and play? 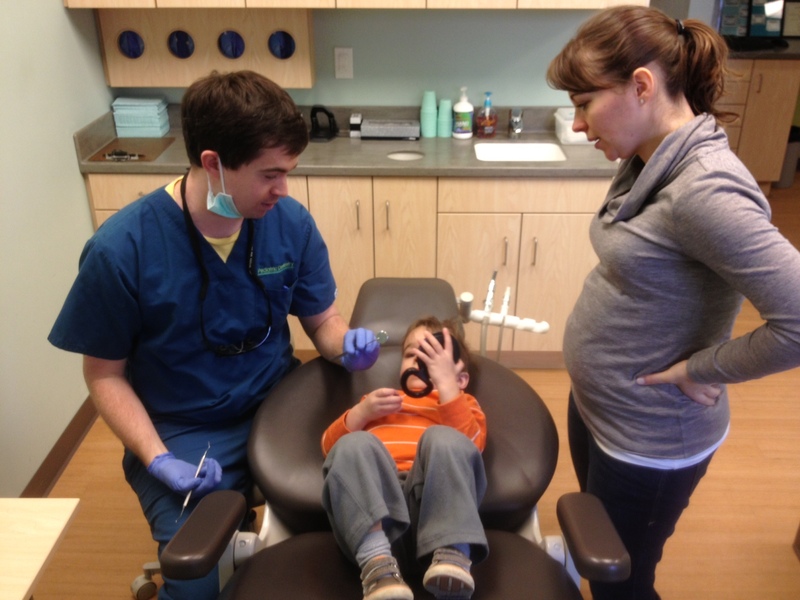 We took Owen for his 2nd visit to the dentist last week. Technically it should have been his 3rd or 4th, since we went for the first time when he around 1, and you’re supposed to go every 6 months, but, well, we didn’t. And I figured that we went for his first appointment earlier than most, so we really weren’t very far behind from a normal kid’s schedule. In the meantime, though, we did floss and brush his teeth every night (except for the random babysitter night, who I ask to “try, but if it doesn’t work out, don’t worry about it”). 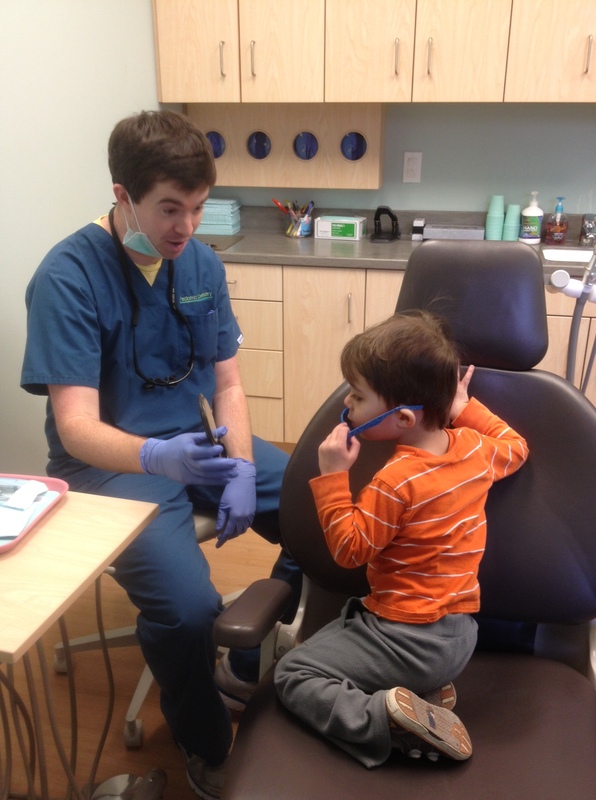 Lucky for us, Benjamin’s dad is a pediatric dentist (remember the Q&A he did 2 years ago? ), and getting to see Pop at work is a total treat! 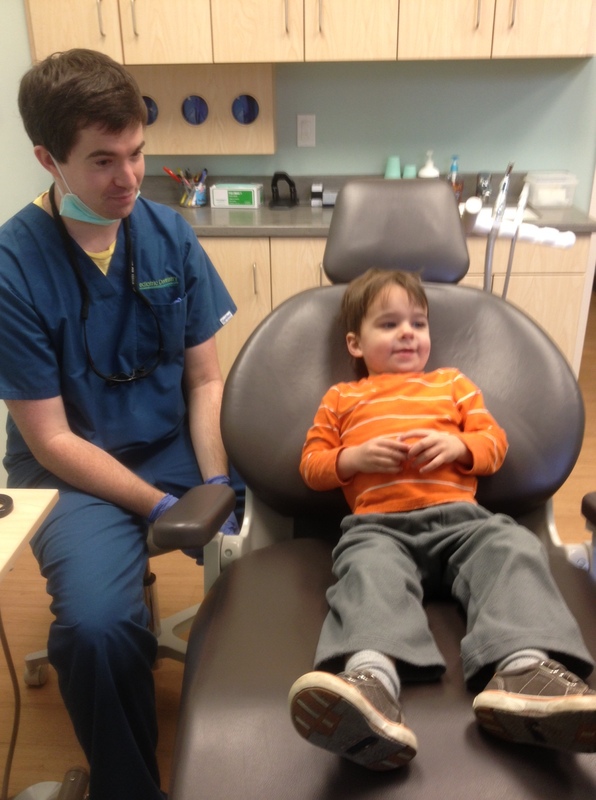 In fact, he is still Benjamin’s and my dentist (ahem, don’t laugh, yes we still go to a pediatric dentist) too. Owen sees another dentist in the practice, since Pop will likely retire while Owen is going there, and we didn’t want to blur the line between family and doctor for him. The visit was awesome. Owen recently got an electric toothbrush (with Thomas the train on it, ohmigoshsoexciting! 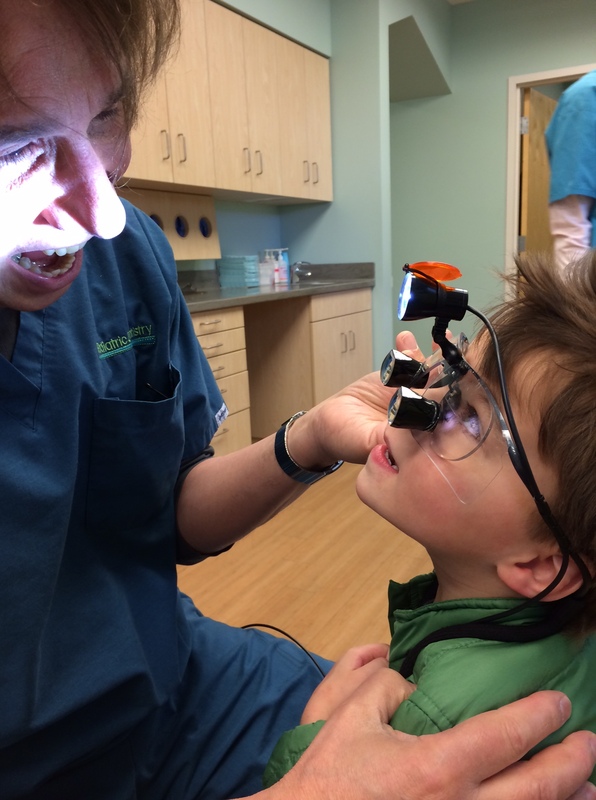 ), so he was totally pumped to bring it to the dentist and show him. Everyone in the office hears all about Owen all the time, so he got quite the warm welcome when we arrived. The first time we visited, Owen was too little to really understand anything about where we were and what was happening. So all they did was take a peek in his mouth and talked to me about dental hygiene habits. This time, though, we were hoping to do a full cleaning and take a closer look. Owen’s dentist was AWESOME. 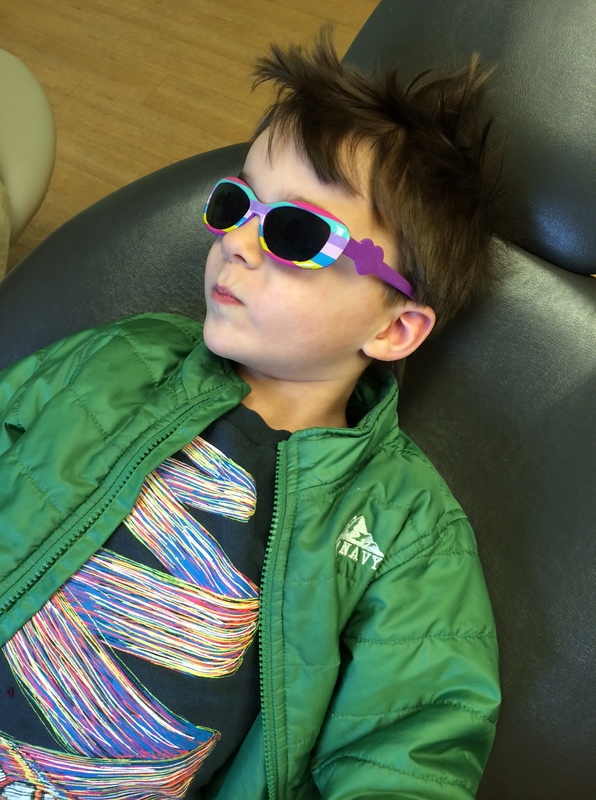 He was relaxed and cool about the whole visit, he let Owen chat all about his toothbrush and hold the mirrors and play with the tools and wear sunglasses so the light wouldn’t bother his eyes. He knew exactly how to ask Owen to lay down so he could look in his mouth, and even had Owen helping him to count his teeth while he poked around with a tool. He loved picking out his toothpaste flavor and the cleaning was super easy. 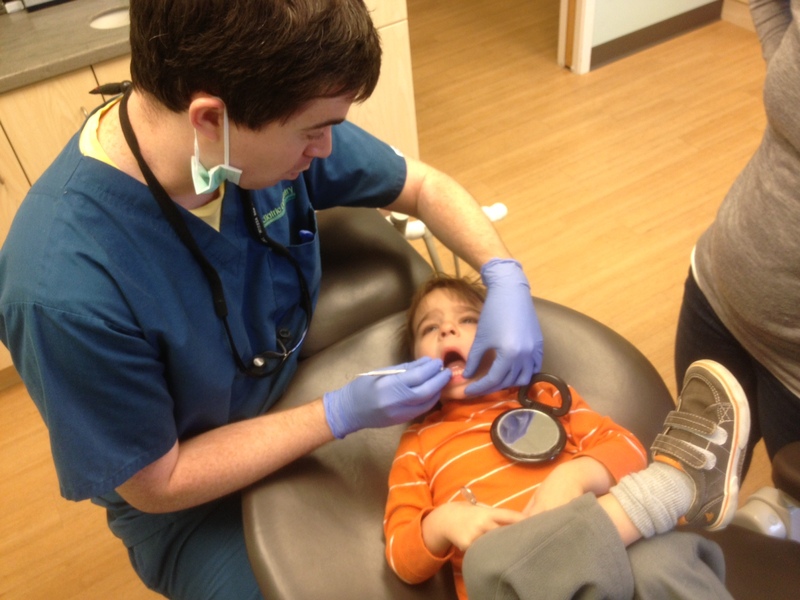 THIS, my friends, is the advantage to a true pediatric dentist, rather than just taking your kids to a regular dentist. Owen was having so much fun! Of course, when he was finished, he got to pick out a toy for being such a good patient. He wanted one of everything, naturally, and kept saying, “When I come back next time, I’m going to get one of THOSE.”. 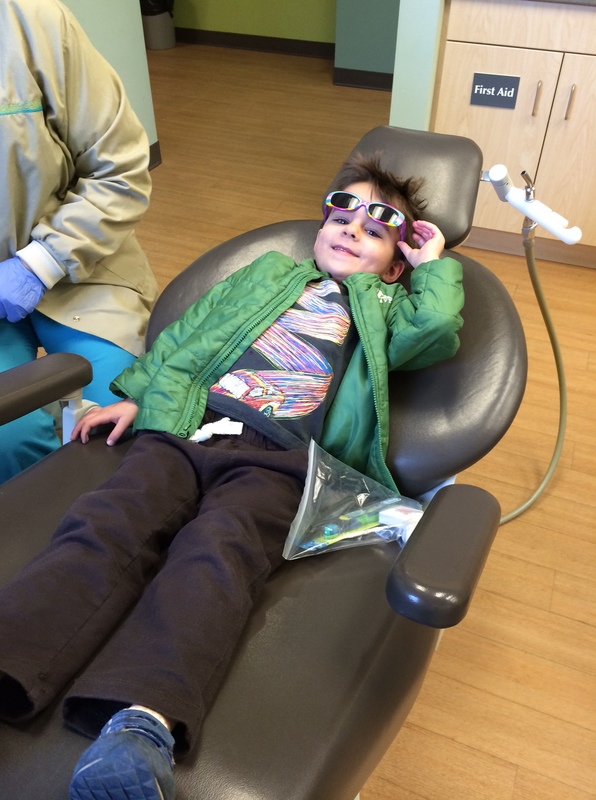 Whatever works to get him excited about going back to the dentist! 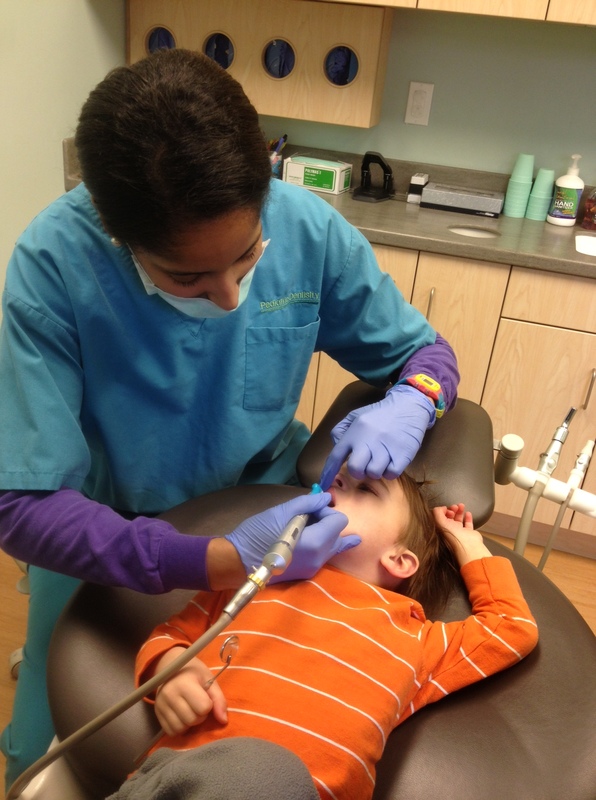 For anyone in the Metrowest Boston area looking for a pediatric dentist, the place where we went is Pediatric Dentistry. After we went to the dentist I happened to be reading an article in Parents Magazine that had a terrifying article in it. It started by telling a story of a 5-year-old kid whose dental x-rays showed 5 cavities, including 3 in his molars that were so severe, they couldn’t be fixed by fillings (he had to get extensive work, including “baby root canals”). Remembering back to my own childhood of being terrified of getting a cavity at every checkup, I can not IMAGINE the horror of finding out your kid has to be put under anesthesia to treat something that could have been avoided (or at least dramatically reduced) by daily flossing and brushing. It’s astonishing. I thought kids didn’t get cavities until they were much older, but apparently I was wrong. And, even though they have baby teeth when they are so young, the dentist can’t just extract them or “let them be” because adult teeth won’t grow in properly. Brushing and flossing for your child until age 6 (says Parents magazine) is really, really serious. So thankful to have started flossing and brushing so young, and already crossing my fingers that we can avoid cavities as long as possible. This week is one of those weeks I wish I could build an impenetrable force field around Owen and keep him in that safe little bubble. For two reasons. 1. 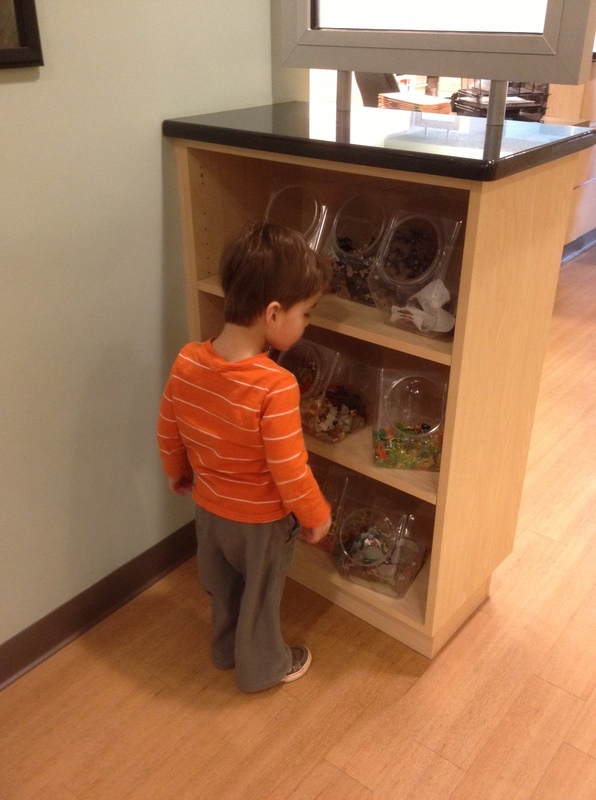 The petri dish that is daycare is overflowing with germs. Today when I signed Owen in, there was a sheet on the counter that said “We have had 3 cases of hand, foot and mouth, 7 cases of high fever and 2 cases of the stomach bug this week. Please remember to wash your hands to stop the spread of germs.” There aren’t more than 12 kids in his class, so either everyone except him is sick, or some kids are counted more than once in that tally. Oy vey. For those of you who were reading back when Owen first started daycare, you know that we had about 6-12 months when he was pretty much sick with something every day. Between his recurring pneumonia and respiratory issues, unusual propensity for high fevers and ear infections, combined with his rash-prone skin, we were pretty much seeing the doctor weekly. But! In the last few months he’s had little more than an ear infection or two. Perhaps that year of illness made his immune system iron-clad, as he has since escaped several bouts of stomach bugs and various other illnesses that tore through his classroom with only a runny nose. Don’t get me wrong, I’m not getting cocky. I know they could still strike at any moment! But at least that “year of the sickies” makes me feel like we can make it through just about any illness now, since we’ve done it before. Except the stomach bug. He’s never gotten the stomach bug. For being a kid who pukes so regularly from being car sick, he has never thrown up from an upset stomach. That’s pretty much the final frontier of sickness we have not yet faced. 2. He is acting like a total pill. I don’t know if it’s an impending illness, or the teething I thought I identified last week, or something else entirely… something is up. The last few days he has been acting totally out of character. Wailing and crying at the drop of a hat. Reacting aggressively to small infractions with hitting and pushing and throwing. Whining and sniffling and clinging to me like I might leave him forever when I really just need 5 minutes to throw dinner in the oven. Pushing himself away from the table and shouting, “I’m ALL DONE!” before even taking a bite of food. Waking up crying from naps and reverting back to early mornings when he had been sleeping in until after 7am. I haven’t yet figured out exactly what is up, but MAN it is exhausting. For all of us. Owen started teething relatively late (his first tooth didn’t pop through until 9 months), but then once they started coming in, they seemed to come in all at once. Four at a time, sometimes, and all of them were in by 18 months. 12-18 months was a blur of rough nights and whiny days (in retrospect, of course). BUT! It was actually better for us (me?) since they came in such a compressed time frame so that I wasn’t constantly complaining about teething and dealing with a sad kid for months on end. I’m very much a “get the bad part over with first” type of person. Don’t drag it out. Since he got top and bottom molars around 18 months, I thought those were the ones everyone called “2 year molars”. I thought that we were done for awhile. Like, a long while. Life from 18 months – 2 years has been filled with great sleep, few illnesses, and little to no medicine. Smooth sailing in the physical discomfort department. Then yesterday I was skimming one of those “Your kid is two! Here’s what he/she should be doing” emails and it mentioned something about 20 baby teeth. I hadn’t ever counted, but 20 seemed like a high number. So last night while I was brushing Owen’s teeth, I counted. And… dun dun DUN. He only has 18. Which means we’ve got 2 mo’ molars to go. This chart was helpful for me to see which ones he has and which are still to go. Actually, I think they may be coming soon. The last week Owen has been fighting a snotty nose and waking up at night crying. He always quickly soothes himself back to sleep, but of course I’m sitting bolt upright in bed listening to him cry. He’s been crying at the drop of a hat when things don’t go his way during the day too, which is not normal for him. I never know whether to chalk that type of behavior up to him being 2 years old and testing limits, or something more physical that he can’t pinpoint, like an ear infection or teething. So far, for us, it’s always been the latter in the past. But of course you never know that until AFTER the tooth pops through or the fever spikes. So a few days ago I started taking his temp and looking for any other signs of an ear infection. Got nothin’ except a whole lot of rare-for-Owen attitude. But he has been putting his fingers in his mouth recently (a habit that irks me to no end; I think it’s gross) and even acted like he was going to bite my arm when I tried to wash him in the bath last night. Both are behaviors that he’s only done in the past during the dark months of super teething. His teacher mentioned that he pushed several of his friends yesterday at school, including pushing one friend until she cried and fell on the floor. In the past when we’ve dealt with physical aggression it has always stemmed from an ear infection or teething — he only seems to hurt others when he is hurting. I’m doing my best to realize this when he’s acting like a pill. When he’s whining and crying in an out-of-character way. When he’s acting out and hitting/pushing/biting. I’m trying to let the past inform our future, and to recognize that maybe it’s because he’s not feeling well. It doesn’t make biting ok, but it helps me be more empathetic and not just annoyed with his behavior. I’m trying to remind myself that in a short period of time, my sweet kid will be back. It just rained for 2 1/2 days straight here. We needed the rain, so when it finally came, I was all yay rain! But then it just kept coming. And we couldn’t go for walks with the dog, or to the playground. I didn’t even want to go out in the car because I hate driving in the rain AND my car has one broken windshield wiper. Side note: That wiper (thankfully the one on the passenger side and not the driver’s side) has been broken for awhile. In fact, it happened when a big ice chunk slid down onto the wipers (which was clearly months ago, since it hasn’t snowed in a LONG time) and instead of scraping it off with a scraper, I just kept running the wipers, hoping they would push the ice away. I either burned out the motor or bent the wiper. Still don’t know which. All I know it is just won’t move. I just never think of it at the right time. I only think of it when I get in the car and it’s raining. And then I don’t have time to go get it fixed. You know? And then as soon as I get home from my errands I’m onto the next thing and don’tchaknowit I forget all about that darn wiper. The other day Benjamin used my car and noticed that it was overdue for an inspection (oops!). And it’s not going to pass inspection with only one working wiper, so now I have TWO errands to run this week, in addition to the usual work slash daycare rigamaroll. So now you know that although I have many spheres of my life working in perfect harmony, taking care of my car is my Achilles heel. It’s always on the bottom of the list. I even run my car on fumes because I hate stopping to get gas so much. I much prefer to walk everywhere and pretend that I don’t even have a car. Ignorance is bliss for me in that arena, my friends. As I was saying, the rain resulted in a long weekend. I always have “long” weekends since I don’t work Mondays, but this one felt longer than normal. Benjamin traveled for the bulk of last week, then he was home for two days, and he’s traveling several days this week as well (no, I won’t tell you which ones, in case you are a creepy person thinking of trying to break into my house while my big scary husband is out of town). Props to the single parents who do this all the time, ’cause damn. Even when Owen is as perfect as a 2 year old can be, it’s still long. Not to mention the fact that since I am adamant about putting away my phone and computer when I’m with Owen and I try to work out during afternoon nap time, when I put him to bed at night I have to face hundreds of emails and some missed phone calls and a day of social media. While I do the dishes and eat something. Oh, and find 5 minutes to sit on the couch, put my feet up and watch some trashy tv so my brain can rest. That’s important too. Yesterday since we couldn’t go to the playground and I didn’t want to push my luck by trying to get Owen to be still and sit in carts all day running errands, we used our good ol’ neighborhood Barnes & Noble as an indoor playground. Whaddaya know, it was a really awesome way to kill the afternoon while the rain poured down! We read every. single. book. about cars, trucks, buses, fire engines and dump trucks. A million times. Twice. He ran through the aisles and pointed out things he saw on book covers and sat in the window seat and watched cars in the parking lot. Despite feeling a little worn out, we had a ton of fun together. The kid is a blast to hang out with. This morning he woke up at 4:55am wailing for “meh-sin” (medicine). He’s been suffering through the 2 year molars for a few weeks now, so I’m hopeful that we’re nearing the end of the it. Then that’s the end of the teeth for awhile, right? RIGHT?! Phew! The sun is shining now, we walked to daycare this morning and I’m at my desk ready to start my work week. Still buried in emails from the weekend, but hey, it was worth it. Long, but worth it. Your 1st year molars are coming in. That explains the weird food “regression” (spot on, Christina! ), the two rough nights we’ve had, the incessant drooling and the obsession with sticking your whole fist in your mouth while crying. Unfortunately, my sweet child, there’s not much I can do for you except cuddle you, pump you full of Ibuprofen, give you frozen food and things to bite on, and distract you. I’m doing the best I can. I thought we were totally getting the hang of getting teeth without drama, but apparently molars are an entirely different beast. In other news, Benjamin came home from his 2nd week away! Unfortunately he took a red-eye back and has another work deadline tonight, which means I am working from home while also taking care of Owen. Who is teething. Anyone want to come over and play? I have a feeling it’s going to be a long day. Especially long when it starts at 5:00am. What We’re Eating: With no husband to cook for and no daycare food to pack (since Owen stays home on Fridays), I did my best to stay OUT of the kitchen last night. I had a frozen burrito, a hard-boiled egg and leftover broccoli I made for Owen for dinner. He had Ian’s gluten-free chicken nuggets (which are TOTALLY delicious, by the way) along with broccoli, frozen peas and peaches. Teeth. Can’t live sleep with ’em, can’t live without ’em. Remember when I was all “oh, teething was not as bad as I expected it to be…“? Well, I take it back. This 2nd tooth is a whole different beast. I (naively) thought that the 1st one was going to be the worst, since it’s an entirely new sensation. And (silly me) I thought maybe we were in the clear since the first one passed with only a slight disturbance. Apparently I was wrong. Owen is such a good natured little chap that he generally deals with pain/illness/discomfort very well, smiling and playing through the pain. But this chronic gum busting is taking its toll. Last night at 4:30am I heard tearful sobs (something I haven’t heard in a long time in the middle of the night). I listened for a minute to see what kind of cry it was, and it was most definitely the “something is actually wrong Ineedyoumama” cry. I kept the lights off as I lifted him from his crib and rocked him sleepily. He stopped crying immediately and I felt his tiny cheek resting against mine grow heavier and heavier as he fell asleep on my shoulder. He wasn’t wet or poopy, he wasn’t feverish, his room was comfortable… I knew the culprit had to be that blasted second tooth pushing its way through his gums. It has broken the surface, so we’re past the razor tooth and weird poop stage, which I thought was the hard part. But this one seems to be giving him a really hard time as it keeps pushing out. Yesterday he kept scratching at his two (adorable) teeth with his tiny little fingernails, making a half-yelling, half-fussing noise that’s like a frustrated “aaaaaaaaargh!” sound. Poor kid. How awful to have your mouth ache all day long. I don’t like giving a lot of medicine, but ibuprofen seems to help a TON. I can tell because the scream-whining stops for a few hours and starts back up again when the meds are about to wear off. I hate to do it around the clock, so I usually alternate with Tylenol, but Tylenol doesn’t seem to touch the pain. I even tried those herbal teething tablets. Nothin’. So Ibuprofen it is, at least until the pain becomes bearable for him. After rocking Owen for a few minutes, I put him back in his crib and the sad little wail started again. The medicine was downstairs, and I didn’t want to wake him up by carrying him through the house (he stays in the nursery at all costs at night; I don’t want him thinking it’s super fun to get up in the middle of the night). So I put him back in his crib and ran downstairs to get the meds. By the time I got back upstairs, he was quiet. Hallelujah! All he needed was a little rocking and he fell back asleep. Right? RIGHT?! So I jumped back into bed and fell asleep. 20 minutes later I heard that wail again. Poor thing. This time I was armed with medicine, so I picked him up out of his crib, gave him a dose, and rocked him some more. Lather, rinse, repeat. Rock, fall asleep, back in the crib. Sad little cry emerges. At this point it was already 5:30am, and usually I let him get up anytime after 6:00am, so I took him back into my bed (Benjamin is traveling again) for at least a little more quiet time before we started our day. Unfortunately there was no sweet, cuddly sleeping like the last time I did this. This time it was all hair pulling and fingers up my nose and kicking his little legs in the air until the covers fell off the bed. Oy. What a morning. I’m thinking part of the problem (in addition to the razor-sharp saw cutting its way through his gums) is that he was hungry. He has been refusing most of his bottles and almost all of his food for the last few days. I assume it’s all teething related. I did a quick Google yesterday and came up with thousands of posts about babies around this age going through a period of refusing food/bottles because of teething and an increasing desire to be more independent (wanting to feed themselves, so fighting when you feed them with a spoon or hold the bottle for them). With Owen it seems to be mostly that his mouth is just so uncomfortable, all he wants to do is bite on teething toys. Sigh. He’s not going to starve, is he? I just keep offering the same foods and the same bottles as normal, and if he wants them, great, and if not, I’m trying to just be ok with it and not make a big deal of it. But it bugs me that he’s not eating (and, ahem, wasting the expensive formula!!!). Have you had experience with similar food/bottle strikes? Were they teething related? Anything I can do that might help his poor, sore gums?